Like 2008, 2009 was a year where TV offered me a lot more in terms of entertainment than the movies did. The gap closed in both directions for me, though, as a number of brilliant series ended or got the hook, and a number of directors stepped up to provide us with one of the stronger movie years of the decade. 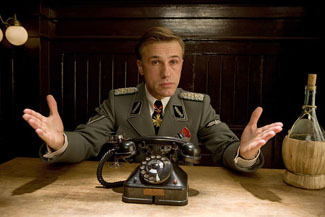 Really, any year for me with a Quentin Tarantino film in release is going to be a good one for me, and Inglourious Basterds provided me with that rare thrill of the unexpected that I haven't had in some time. It's now the fourth time that a Tarantino film has topped my yearly list (the other three being Reservoir Dogs, Pulp Fiction and Kill Bill Vol. 1) at a time when it feels like I should probably be growing tired of his films, and his strange genre affectations. And I entered into Basterds expecting to find that Tarantino had given into the simple gore mentality of the last few years, and based on the ads I don't think I could be faulted for that. Instead, I found Tarantino using a WWII backdrop for a meditation on the power of cinema and its essential nature in determining truth, structured around three incredible set pieces. I never should have doubted you Quentin, even if I still can't really stand you as a person that much. 4 Steven Soderbergh The Informant! 5 Matt Damon The Informant! 6 Scott K. Burns The Informant! 3 Yeah Yeah Yeahs It's Blitz!